Joseph Caramadre has spent a lifetime scouring the fine print. He’s hardwired to seek the angle, an overlooked clause in a contract that allows him to transform a company’s carelessness into a personal windfall. He calls these insights his “creations,” and he numbers them. There have been about 19 in his lifetime, he says. For example, there was number four, which involved an office superstore coupon he parlayed into enough nearly free office furniture to fill a three-car garage. Number three consisted of a sure-fire but short-lived system for winning money at the local dog track. But the one that landed him on the evening news as a suspect in a criminal conspiracy was number 18, which promised investors a unique arrangement: You can keep your winnings and have someone else cover your losses. Caramadre portrays himself as a modern-day Robin Hood. He’s an Italian kid from Providence, R.I., who grew up modestly, became a certified public accountant and then put himself through night school to get a law degree. He has given millions to charities and the Catholic Church. As he tells his life story, his native ability helps him outsmart a phalanx of high-priced lawyers, actuaries and corporate suits. Number 18 came to fruition, he says, when a sizeable segment of the life insurance industry ignored centuries of experience and commonsense in a heated competition for market share. Federal prosecutors in Rhode Island and insurance companies paint a very different picture of Caramadre: They say he’s an unscrupulous con artist who engaged in identity theft, conspiracy and two different kinds of fraud. Prosecutors contend he deceived the terminally ill to make millions for himself and his clients. For them, Caramadre’s can’t-miss investment strategy was an illusion in which he preyed on the sick and vulnerable. ProPublica has taken a close look at the Caramadre case because it offers a window into a larger issue: The transformation of the life insurance industry away from its traditional business of insuring lives to peddling complex financial products. This shift has not been a smooth one. Particularly during the lead up to the financial crisis, companies wrote billions worth of contracts that now imperil their financial health. In a series of detailed interviews, Caramadre said the companies designed the rules; all he did was exploit them. Their hunger for profits in a period of dizzying growth and competition, he contends, left them vulnerable to someone with his unusual acumen. The companies have argued in court that Caramadre is a fraud artist who should return every last dime he made. In his rulings to date, the federal judge hearing the civil cases has agreed with Caramadre’s contention that he was doing what the fine print allowed. The secret to Caramadre’s scheme can be glimpsed in a 2006 brochure for the ING GoldenSelect Variable Annuity. On the cover is a photo of a youthful older couple. The woman sits next to a computer, sporting a stylish haircut and wire-framed glasses. A man with graying hair and an open collared shirt, presumably her husband, is draped over her in a casual loving way. Images of happy vibrant seniors enjoying their golden years together — frolicking on the beach, laughing in chinos next to a gleaming classic car, enjoying the company of grandkids — populate the sales material for life insurance’s hottest product — the variable annuity. As outlined in the brochure and in countless others like it, the contracts worked this way: The smiling couple gives money to ING in return for the promise of future payments. The consumer chooses how the money is invested, usually in mutual-like funds that have stocks, bonds or money market instruments. This is the “variable” part of the equation. Variable annuities also typically include a life insurance component called a guaranteed death benefit. With this guarantee, if the market crashes — but you die before your investment recovers — your beneficiary still gets a lump sum equal to either the death benefit or the value of the investments in your account, whichever is greater. The target audience for brochures like that of ING’s are people nearing retirement with a nest egg to safeguard and perhaps grow a bit. It’s a huge and growing market. In 2011, as the first wave of baby boomers began to retire, there were more than 40 million people age 65 or over. Between 2001 and 2010, life insurance companies sold about $1.4 trillion worth of variable annuities, according to LIMRA, an industry association. Caramadre got the seeds of his idea in the mid-90s when he attended an investment seminar for insurance agents. He quickly saw how variable annuities could be a hot product for insurance companies — particularly when they could charge hefty fees for attractive goodies like the guaranteed death benefit. Caramadre decided that he wouldn’t offer variable annuities to clients in the way the insurance companies envisioned. It was too expensive. “They are just whacking you for fees,” he says. What Caramadre wanted was a way to get his clients the benefits without their having to die. Society has long frowned on certain behaviors. Taking out an insurance policy on a friend or neighbor and killing them? Not acceptable. Taking out a life insurance policy that gambles your neighbor will die soon, even without your help, also crosses the line. Today, it is well-established law that one must have what is called an “insurable interest” before purchasing an insurance policy on someone else’s life. The person who benefits from the policy must be a relative or business associate who himself would face financial or familial loss from the death. Insurable interest worked fine for 200 years or so until the life insurance business itself changed. Despite its name, the industry doesn’t sell as much “life insurance” anymore. Life companies now peddle financial services, particularly annuities. Variable annuities were developed in the 1950s, initially as a way to give teachers retirement options. Insurable interest was not an issue and could have been an impediment to widespread adoption of the product. Caramadre did his research and concluded that Rhode Island law did not require that people buying variable annuities have an insurable interest. As imagined by the insurance companies, variable annuities have two participants. There’s the investor, the person who puts up the money. That person typically also serves as the annuitant, or the “measuring life.” If that person dies, the death benefit is paid to the beneficiary, usually a spouse or child. Caramadre realized it didn’t have to be that way. There was no requirement that the investor and the annuitant be the same person. In fact, as he read the contracts, the annuitant didn’t need to have a relationship with the investor at all. Caramadre or one of his clients could buy an annuity on the life of someone who was not expected to live long and then pocket any profit when that person died. “All we need to do is replace the necessity of the investor having to die, with someone else, dying,” says Caramadre. If they chose well, the account went up and they reaped the benefits. If they chose poorly, the death benefit kicked in and they recouped their original investment. “If you won, you keep the winnings. If you lose, they give you your money back,” says Caramadre. There is something morally unsettling about this. Put simply: Caramadre was setting himself and his clients up to profit from the demise of strangers. While the macabre aspect of his scheme offends many, it did not make Caramadre squeamish. He rationalized that a lot of people — funeral homes, hospitals and cemeteries — make money from the dead and dying, why not him? Caramadre’s insight might have remained a curiosity were it not for something called “the arms race.” As competition intensified in the mid-2000s, many life insurance companies launched an unprecedented war for customers, offering benefits they now acknowledge were far, far too favorable. The insurance companies’ contracts provided little defense against Caramadre’s approach. For policies under a million dollars, they didn’t check the health status of people receiving variable annuities. Instead, they limited the ages of annuitants or the amount that could be invested. All that the companies required for persons to serve as a measuring life was their signature, birthdate and Social Security number. Some didn’t even require the signature. There was usually only a single line that touched on insurable interest in the contract. Companies would ask if a relationship existed between the investor and the annuitant. Caramadre and the men with whom he worked would either leave the answer blank or type in “none.” The companies, eager for business, took the policy anyway. The lawyer who represents both Transamerica and Western Reserve declined to comment. The more serious charges are the criminal ones. 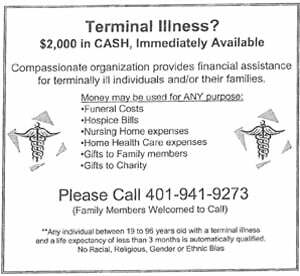 Caramadre usually paid dying people between $3,000 and $10,000 for agreeing to serve as annuitants. He characterizes the arrangement as a win-win for everybody but the insurance companies. Prosecutors charge that he instructed participants in the scheme to lie, to steal identity information and to forge the signatures of annuitants in an effort to defraud insurance and bond companies. The story as told by prosecutors goes like this: In an effort to get rich, Caramadre and his associates enticed the dying to give up their vital information by offering them $2,000 as a charitable donation. More than 150 people received the $2,000. Of those, at least 44 went on to play a role in number 18. The government alleges that Caramadre directed his associates to lie to both the annuitants and the insurance companies. Sometimes, prosecutors assert, the dying people had no idea someone else stood to profit. In other instances, the indictment says, dying people were told that their signatures were just for the receipt of the charitable donation. A Caramadre employee allegedly told other family members they would be the beneficiaries. In five cases, the government says, signatures were forged. Caramadre denies the accusations. He says that he instructed his employees to properly explain the program to the annuitants and that he would never permit forgeries. Youthful looking with a round expressive face etched with deep lines across his brow, Caramadre appears more like an eager-to-please bulldog than a criminal mastermind. During the arms race, he says, companies did not complain when Caramadre paid their hefty fees and later filed claims seeking death benefits. Family members didn’t object either. Everything changed in 2009 with the financial crisis. Companies started to feel the consequences of the arms race, the insurance companies sued and the FBI began visiting relatives and surviving annuitants. Today, some of those family members are the strongest witnesses for the prosecution. Caramadre learned to hustle early. He graduated from the University of Rhode Island in three years with an accounting and finance degree, supporting himself through odd jobs that included running his church’s weekly bingo game. After graduation, he took a job at a bank preparing documents for trusts. A friend convinced him that his fastest track to becoming a millionaire would be to sell life insurance, so he took a job as an agent with the Penn Mutual Life Insurance Company. Caramadre had landed in an industry on the cusp of a historic transformation. Life insurance used to be safe and profitable. Many insurance companies had begun in the 1800s as mutual aid societies. They were ostensibly owned by their customers who sometimes even received dividends. The idea behind the business was simple: Collect premiums from lots of people at a price high enough to account for mortality, which can be quite accurately predicted. The companies invested their pools of money. When they wandered into trouble, it almost always involved poor investment choices rather than unforeseen behavior by policyholders. By 1985, annual compensation for a top company CEO could be in the high six figures. While this was not a Wall Street salary, the business had the benefit of comfortably predictable profits. Insurance agents worked for specific companies and offered products only from that firm. The agent was a man of the community, hawking a service that few young and healthy people want to contemplate. The old adage in life insurance is that “it’s sold, not bought.” Agents sold a relationship and a vision for the future, encouraging clients to protect their family from a tragic event and, possibly, give their heirs a leg up. By the 1990s, the business was changing. Under pressure from banks offering new retirement products including annuities, insurance companies decided to shed the cost of keeping large numbers of agents on their payroll. Rather than train, staff and equip insurance agents, the industry moved increasingly to a freelance model. “Independent” insurance agents paid for their own offices and expenses solely through commissions earned on the policies they sold. Insurance companies like Prudential, which once had as many as 18,000 agents, whittled their in-house force down to about 2,500. The rise of independent agents was accompanied by the widespread transformation of mutual companies. Between 1985 and 2003, more than 20 mutual life insurance firms converted themselves into stock companies, most of which were traded on Wall Street. This process heightened the focus on quarterly earnings and eventually helped lead to an increase in executives’ pay. Rising stock prices meant bigger bonuses. The change in culture and incentives in the life insurance business created the perfect conditions for the arms race. It also made the business a prime target for Caramadre. It wasn’t until the 1990s that the growth of variable annuities took off. Between 1990 and 1999, the amount of variable annuities individuals purchased in the U.S. leapt from $3.5 billion to nearly $63 billion in 1999, according to the American Council of Life Insurers. For the companies, it was easier to sell a product customers could use while still alive. Unlike life insurance, annuities did not require an expensive health examination. Life insurance was based on premium payments that remained steady. But the yearly fees charged on annuities, which sometimes topped 4 percent of the value of the account, would rise in line with those values. More money under management meant more fees, which buoyed the companies’ stock prices and their executives’ compensation. Annuities were not a terrible idea. They fit a growing gap in the nation’s pension system. The defined benefit plan, a retirement approach where the employer guaranteed a pension based on salary and years of service, was disappearing. From 1980 through 2008, the proportion of private sector American workers covered by company pensions fell from 38 percent to 20 percent, according to the Bureau of Labor Statistics. Meanwhile, a demographic bubble of baby boomers needed other retirement options. Annuities seemed to be tailor-made. At Penn Mutual, Caramadre broke sales records, becoming at age 24 one of the youngest Golden Eagles — a recognition the company bestowed on top sales performers. Caramadre left Penn Mutual two years before the company ended its captive agent system. As an independent agent he could find better deals for his customers on the open market. He became a student of insurance products, deconstructing the product software provided by the companies, delving deep into the contracts. It became almost like scouting a ball player, he says. Caramadre says annuities provided only about five percent of the profits he made from his business. He says he took out policies for himself, family members and clients. When he offered his “creation” to investors, Caramadre would either share the commission on the policy with brokers who worked in his office or, in a few cases, he would take a percentage of the gain on the account, he says. He says his lawyers have advised him not to reveal how much he made but it was likely in the millions. Prosecutors allege that he and his accomplices fraudulently obtained $15 million from insurance companies. Caramadre anticipated that eventually companies would close the loopholes and shut him down. But what began in 1995 with AIDs patients grew over time to an effort that advertised weekly in a Catholic newspaper aimed at hospice patients.By 2006, Caramadre had several people combing through the fine print of variable annuity prospectuses. He claims they looked at 680 of them that year. Most he could eliminate quickly. The companies were too small or had sub-par ratings. If they lost millions, they might go out of business which would be bad for both Caramadre and the company. Caramadre found that the companies with the best benefits were the ones who were most eager to expand their market share. ING Group, for example, was a favorite selection. The Netherlands-based company went on an acquisition spree in the 1990s in an effort to become a dominant player in the U.S. annuities business. ING spent most of the arms race fighting to stay in the top 10 life insurance companies in variable annuity sales. In 2004, ING had new annual variable annuity sales of $7.7 billion. Four years later, that number had increased to $12.3 billion, according to Morningstar. “When a company is pushing hard to sell bells and whistles on a product — they are desperate to get money through the door — either because they are in an expansionary phase or they want more assets under management in order to sell themselves to a bigger company,” Caramadre says. ING offered a bevy of benefits. It started with a “bonus credit.” This became common by late 2006. In the case of ING’s Golden Select Premium Plus variable annuity, the company promised to add 5 percent of the value of the contract. If you deposited a million dollars, the insurance company would add $50,000 on top of it. Why would ING give away free money? It never expected to pay the majority of the benefits it offered. The 5 percent was added to the death benefit, which was held in a separate account known as a shadow account. The insurance company only paid the shadow account if the policyholder died and the money — the million dollars — in the real account had shrunk to a lesser value. The companies’ models of customer behavior, which were based on data collected before the 2008 financial collapse, predicted that the death benefit would rarely be paid. Something would happen. Policymakers would take the money out for a big purchase, surrendering their account. If the policyholder annuitized — started taking a stream of monthly payments — the shadow account disappeared. In any event, the rising market made it likely that the account would outperform the promises. But the models turned out to be the insurance industry equivalent of the housing bubble. When the market crashed, consumers began acting differently than they had in the past. Perhaps the gaudiest of the benefits the companies never expected to pay was known as the “rachet.” The idea was perfect for a steadily rising market. Say you had $1 million in your account in 2007 and your investment did well, boosting the value to $1.2 million. That amount would be set on a given date as your death benefit which you would be paidno matter what had happened to your investment. If stocks cratered, as they did in 2008, and your account fell to, say, $600,000? The insurance company would still owe you $1.2 million when you died. ING offered a quarterly ratchet — it set every four months — and charged only about a quarter of a percent annual fee to customers who wanted it. Many companies, including Nationwide Life and Annuity Insurance Company and Transamerica Life Insurance Company, offered monthly ratchets. To differentiate themselves, companies also sold exotic investment options into which the buyers of the annuity could invest their funds. ING featured funds managed by reputable companies like Pimco, Fidelity and T. Rowe Price. Each fund carried a fee that ING split with the fund manager. While ING provided aggressive growth and real estate funds, many annuity companies went beyond that to give consumers a choice of funds that used derivatives to bet for or against the market, sometimes with multipliers, so-called double betas. For example, if the stock market plunged, investors could double their money. Caramadre’s first step was to make sure his clients qualified for every incentive. If there was a monthly ratchet and bonus, he might invest the funds in a money market account until the ratchet set with the bonus. It was as if Caramadre was playing with the house’s money and going straight to the blackjack tables. With decent gains locked in, he would take flyers on the riskiest investments possible. Sometimes, he would invest his clients’ money in two variable annuities, one that paid out if the market went up and the other if it declined. It didn’t matter. When the annuitant died, Caramadre’s client, at the very least, would get both principals back plus the gains from whichever fund paid out. Caramadre kept increasing the number of annuitants and placing big bets. “It was pretty fun being in the market without the risk,” he says. The fun ended in 2009 when the insurance companies began to investigate. In March, Nationwide formally complained to the Rhode Island insurance supervisor who didn’t take any action. Nationwide had calculated the fees it charged and the guarantees it offered based on the assumption that the policyholder would keep the product for a certain period of time, it told Rhode Island officials. Caramadre’s treatment of the annuity as a short-term investment caused “a negative economic impact on annuity issuers such as Nationwide,” the company wrote in its complaint. Nationwide’s main allegation involved a lack of insurable interest, the relationship between the investor and the annuitant. “It is Nationwide’s position that the insurable interest statute applies to annuity contracts,” the company wrote. Attorneys for the two insurance brokers who worked with Caramadre, Edward Hanrahan and Edward Maggiacomo Jr., filed detailed responses to the Nationwide complaint with the Rhode Island state insurance regulator. “Having attracted buyers, Nationwide now seeks to evade its payment obligations, which arise from the very documents that Nationwide itself drafted,” Hanrahan’s response read. In 2009, Alaska and Nebraska were the only two states with insurable interest statutes that encompassed annuities in all circumstances, according to Adler, Pollock & Sheehan, one of the law firms that prepared the response. It said Rhode Island has no such requirement. Nationwide filed suit against one of Caramadre’s investors in May of that year, a suit it would lose. Transamerica and Western Reserve would wait until November to file their suits. In June, Caramadre got word that the FBI had contacted one of the hospice nurses who had referred annuitants to him. Asked specifically about the meeting and this accusation, a Department of Justice spokesman declined to comment. An FBI agent started conducting interviews with hospice workers, investors and family members of annuitants. Investigators learned that most of the contact with the dying participants had occurred with Raymour Radhakrishnan, an employee Caramadre hired in the summer of 2007. A graduate of Wheaton College in Boston, Radhakrishnan was only 23 years old at the time. His job would be to interact with the annuitants: assess their health, explain the program, get their signatures and dispense the cash. Mainly, he would oversee a growing corporate bond program (Creation 19). The bond program had similarities to the variable annuity scheme. Caramadre would buy certain corporate bonds on the secondary market. After the financial crisis, these bonds were selling at a steep discount. As a sweetener, the companies that originally sold the bonds had included survivorship rights for co-owners. For example, if you owned the bonds with your wife and she died, you didn’t have to wait decades to redeem them. The company would buy them back at full value. Caramadre would “co-own” the bonds with a terminally ill person. When that person died, he would redeem the bonds at face value, reaping the value of the discount. Radhakrishnan is a co-defendant along with Caramadre in what the government contends was a vast criminal conspiracy. Reached through his public defender, Radhakrishnan declined to comment. He has pleaded not guilty to the charges. Radhakrishnan’s conversations with the terminally ill are at the heart of the criminal case against both men. Caramadre seldom met with the annuitants directly, but prosecutors allege that he instructed Radhakrishnan to deceive the potential annuitants. FBI reports, depositions and interviews suggest that Radhakrishnan told different stories to different potential annuitants. The most serious charges against the men involve allegations that they forged signatures. One forgery count in the indictment involves Stephanie Porter’s mother, Bertha Howard. In January 2008, Radhakrishnan met with Howard and Porter at Fatima Hospital where she was being treated for lung cancer that had spread to her brain and spine, according to Porter. Radhakrishnan gave her mother a check for $2,000 and explained how Howard might be able to get more if she signed more documents. The next meeting between Radhakrishnan and Howard occurred in a nursing home a few weeks later. Porter was also present. She says her mother, shaky and heavily medicated, struggled to sign some forms. There was no additional explanation from Radhakrishnan, according to Porter. A week later, Howard died. Shortly after that Radhakrishnan called Porter to tell her that the company would not accept the signatures so there would be no more money forthcoming. Porter said it didn’t matter since her mother was dead. But a bond account was opened under Howard’s name nonetheless. On the account are signatures that Porter does not recognize as those of her mother. The indictment charges that they are forgeries. Caramadre says it was a mistake and documents he provided to ProPublica show that no money was ever put into the account. The prosecution persuaded a judge to allow it to take depositions of dying participants in the schemes even though no charges had been filed at the time. Over a few weeks in hospitals and private homes, with tubes in their noses and a variety of high-powered medications in their blood streams, the annuitants testified that they did not understand the arrangement they had entered into with Caramadre and Radhakrishnan. Some denied writing their signatures on forms submitted to insurance and bond companies. Caramadre believes the depositions show that the FBI and prosecutors misled witnesses and thus tainted their testimony. (See video clips from the depositions.) An FBI spokesman said the agency does not comment on active cases. 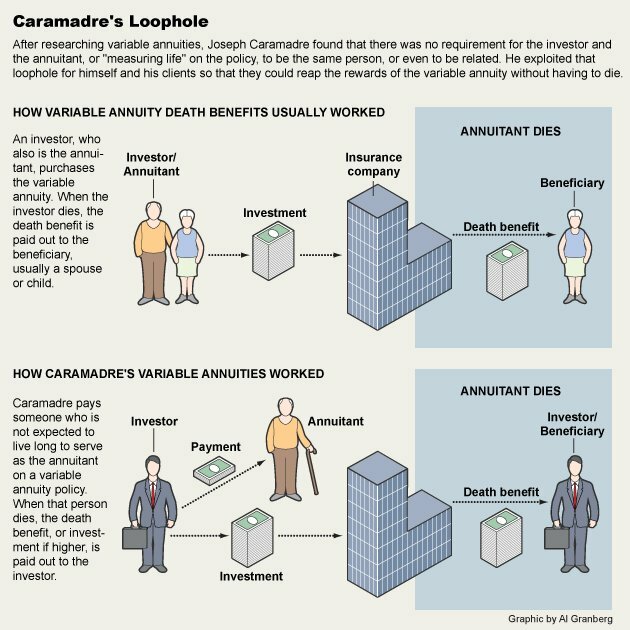 The Wall Street Journal wrote two stories on Caramadre’s cases, one in February 2010 on variable annuities and another a month later on the corporate bond program. Two months later, the National Association of Insurance Commissioners held a hearing on stranger-originated annuities. Thomas R. Sullivan, a former Hartford Insurance executive and the state regulator from ING’s home state of Connecticut, chaired the meeting. In November 2011, after almost two years of work, a Rhode Island grand jury issued a66-count indictment against Caramadre and Radhakrishnan. Their criminal trial is scheduled to begin in November. Today, several of the companies Caramadre targeted have stopped selling variable annuities. ING has been forced to get out of the business and write down billions in losses. Others have had to boost their reserves. Transamerica is trying to buy back some of the variable annuities it sold to policyholders. The French insurer Axa is offering its variable annuity holders money if they surrender their death benefit guarantees.